London 2012 – Praise UK sport!! Undoubtably Team GB has had it’s best Olympics ever and in my opinion this is only possible because of UK sport – the funding body for high performance sport in the UK. I have been playing around with the table below and it shows some interesting things in my opinion. Table 1: Shows the Olympic sports, their funding for the Olympic cycle leading to London 2012, medals won by each sport, whether the sport met its target and how much a medal costs in each sport. According to this table the most expensive GB medal of London 2012 was the hockey bronze and the most cost effective sport was boxing costing £15,013,200.00 & £1,910,280.00 per medal respectively. A closer look does show us some interesting points though, five sports exceeded their target, 23 were within their target and only one was below it’s target. We should look at this more closely though. For example, of the 23 on target 12 were not expected to medal (we’ll discuss this below) and judo exceeded its target but it should be clear that this was a new target after the sport became red under the UK sport traffic light system within the Mission 2012 strategy; they were actually on target for their original prediction of 2-3 medals. 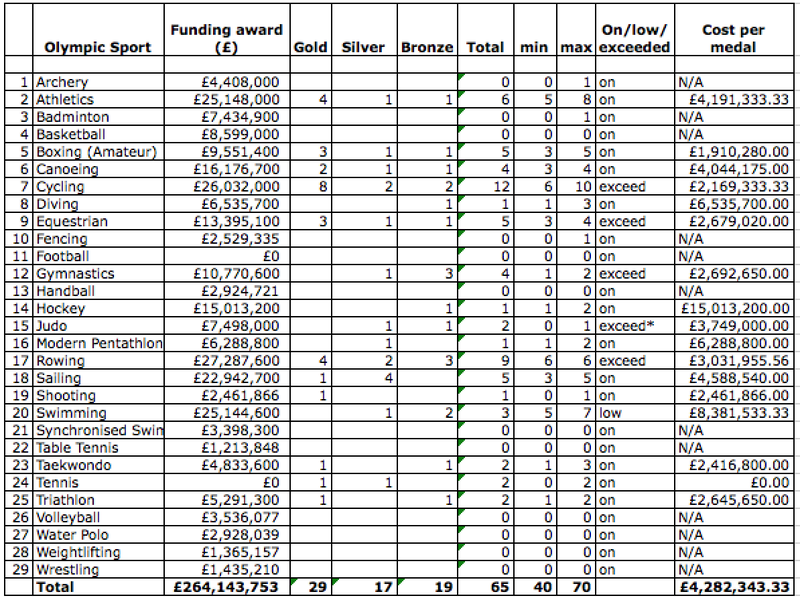 So why does UK sport give so much money to sports that were never expected to medal and indeed did not medal? £39,772,587 to be exact! Well the truth is that in order for us to deliver in the future sports need a system for delivering high performance athletes and to build this system takes time – more than a single 4 year cycle. In Beijing we won 47 medals from around 11 sports, in London we won 64 medals from 17 sports. Therefore there were sports in exactly the same position as our 12 non-medal sports that developed from 2008-2012 to deliver – diving, shooting and triathlon for example. In certain sports you can only win 2 medals (mens and women’s) for example hockey, football, handball, basketball, volleyball and water polo. If this table shows us the average cost of a medal is just over £3.5M then how can we justify more than £7m for these sports? Basketball and hockey both got more than this during this cycle – hockey more than double this. This leads you to consider sports with multiple medals – swimming, judo, weightlifting, wrestling for example. If we could get these sports to consistently deliver 5-8 medals like boxing and equestrian did in this cycle that would be around another 20 medals – we’re not far off the USA then! But if these sports are to produce they need a system. I believe UK sport made the correct decision to fund sports over multiple Olympic cycles in order to develop a system – this is essential for us to continue improving – cycling, sailing and rowing can only win so many medals. I do not have enough inside knowledge to know which sports are close to a system that consistently produces medals other than those that do already although I would guess boxing and taekwondo are close, maybe athletics in another Olympic cycle or two? Can our higher profile sports get some of their budgets from sponsorship thus freeing up some of the UK sport money for other sports. Cycling for example has the sky money on top of their UK sport money but many sports cannot get this level of sponsorship, is this fair? Eventually it would be great if the majority of sports were sustainable in this way. Of course most people reading this will be from judo, what do I think about judo’s funding. Well lets be honest we have done better than we thought in terms of medals but does that mean we have a system? Certainly not, the BJA are still working with an interim performance director and despite several interviews they still have not offered him full-time employment. If you were UK sport would you give judo lots of money? Do we honestly have a system we feel can consistently produce medals? Do we feel we’re working towards such a system? I personally don’t think so but it is not all doom and gloom. I used to visit the BPJI regularly under our previous management structure and in honesty it was beyond depressing. But I also went after Daniel Lascau had been here a while, of course it was the same place, poorly thought out in terms of high performance training but there was always an air of optimism, athletes were working harder and there was discipline based upon respect rather than fear. UK sport have seen Daniel change our high performance training without being able to make a single structural change and therefore I would guess they would/should feel confident in his ability to deliver over a 4 year period with complete control. Would they trust someone completely new after what happened during our last cycle? Anyway, this post is more about praising UK sport for a job well done! They predicted between 40-70 medals (which is a big boundary to be fair) and they got 65. Their consistent attention to detail and challenging of conventional wisdom has proven a great success!